Clifford Knight (1886-1963) was an American writer who wrote a substantial number of mysteries featuring amateur detective Professor Huntoon Rogers, including The Affair of the Jade Monkey which appeared in 1943. The setting is Yosemite National Park. This clearly pleased the Yosemite National Park authorities because in the 1990s they issued it in paperback as a Yosemite Mystery. It’s fairly easy to find affordable copies of this paperback edition. Professor Rogers has asked to join a hiking party in the park but it’s not the scenery he’s come for. He’s trying to unravel the mystery of a dead man, a dead man found in the park in a state that makes identification very uncertain. It’s a time-honoured murder mystery technique to take a group of maybe a dozen people and temporarily isolate them from the rest of the world. They then discover that one of them is a murderer. A hiking party in the wilderness serves this purpose admirably. This is to be a seven-day hike and by the morning of the second day the murderer has already struck. I’m a bit of a disadvantage reviewing a book like this because to me the idea of voluntarily setting off into the wilderness, on foot, is so bizarre as to be incomprehensible. And as for national parks, I’m sure they’re a most admirable institution, but I wouldn’t visit one if you paid me. So Knight’s attempts to create an atmosphere of peace amid natural beauty, a peace that will of course be shattered by murder, is kind of lost of me. To me the whole thing seems like a nightmare, even before the murder. Having said that I can see that if you’re susceptible to this nature stuff you probably would find the atmosphere quite effective. Of course normally you’d think that the first thing to do would be to contact the sheriff but apparently in a national park in the U.S. (in 1943 anyway) the park ranger conduct their own criminal investigations, they make any necessary arrests and the park even holds its own preliminary hearings. So the park rangers basically have all the powers of cops. This is one of the intriguingly original things about the novel. It also makes it plausible that the park authorities, knowing that the rangers have no experience in conducting a murder enquiry, would call on an outsider like Professor Rogers to help. Having a murder mystery set in the wilderness is interesting but what makes it more original is that it’s not a stationary setting. A murder occurs, and then next day they’re off on the next stage of the hike. I have to say that based on this novel having park rangers investigating murders is probably a seriously bad idea! Things like preserving the crime scene, looking for fingerprints, looking for footprints, making some effort to estimate the time of death - they don’t do any of that stuff. Forensic science isn’t going to play any part in the solution. And it’s pretty hard to keep track of people in the middle of the wilderness so alibis are going to be tricky. This means that the investigation is primarily centred on motives. Neither Rogers nor chief park ranger Floyd Plummer do much active detecting. Mostly they just get people talking. Once they start talking Rogers likes to let them keep going, while he keeps listening, and slowly he starts to piece at least a few of the pieces of the jigsaw together. In the beginning the hiking party seemed to be a collection of complete strangers. As the story progresses we discover that this is not the case at all. There are intricate connections that seem to tie just about every member of the party to one or more of the other members. This is not coincidence. Most of the members of the party did not join this particular party randomly. As the connections are slowly revealed various motives start to take shape. At the start it appeared that nobody in the party had a motive for any of the murders. Eventually we find out that almost all of them have motives. As you might expect from what I’ve said so far the clueing is mainly in the form of pointers towards motives. Since such pointers can be somewhat vague it makes it a bit hard to say if it’s fairly clued or not. There’s one major physical clue which is of course the jade monkey itself but I certainly had not the slightest idea of its significance until the very end. There was another major clue that I knew was very important, but again I had no idea what it actually meant. So Knight’s plotting was certainly good enough to fool me. As for the solution, this is one of those books that has not so much a plot twist as a genre twist at the end. It doesn’t quite belong to the genre to which it originally seemed to belong. Whether you find the solution satisfactory depends on how you feel about this. It’s not that this isn’t a puzzle-plot mystery, but there’s something else going on. Mind you, there are clues pointing in this direction. I hope I’ve made all that sufficiently vague to avoid even a hint of a spoiler! There are some major red herrings. The plotting is complicated and while it doesn’t fit together with the precision that you’ll find in a plot by a Crofts or a Carr I think the plot can be regarded as quite serviceable. 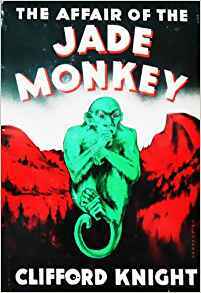 So The Affair of the Jade Monkey has quite a few slightly odd and original features, and an unusual setting. I think that’s a more than sufficient reason to recommend this one.